Google Calendar tests a new feature that lets you view your calendar and the calendars of your guests when you create a new event. "Sneak preview" can be enabled when you click on "create event". "We're working a new feature that makes it easier to schedule events with guests. 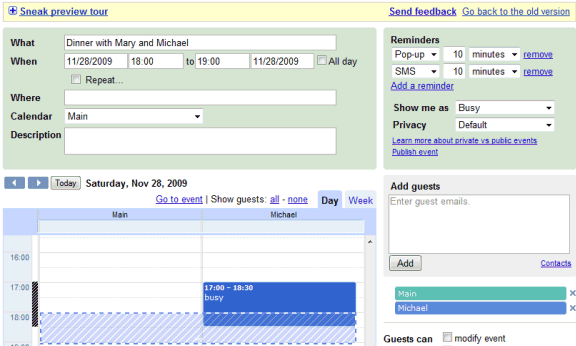 The new event page will include a calendar right next to your guest list, so you can see when people are free," explains Google. "Sneak preview" helps you schedule events and it lets you find a better time for an event using drag and drop. Great Google. Keep it up. Thanks. This is really a very nice feature. I have tested it and the experience has been very nice. good feature, anything that makes life easier is a good..
We can create event in main calendar after that edit it right there. Google always comes with new idea. Google is "Previewing" so many things right now. And, it sounds like it would be a very useful feature although at the same time it just seems as though it wouldn't be used all that much by the average person. I am hoping that Google begins to focus on completing 1 or 2 projects to their fruition. I turned on the sneak preview and now everytime I try to edit an existing event in my google calendar it takes me to the sneak preview screen and will not let me edit ANYTHING. If I try to click on go back to the old version nothing happens. Does anyone have any idea how to fix this. I rely on google calendar everyday and this is getting very frustrating. Personally I don't like it, won't use it, and have no need of it... AND I'd like to get rid of the "sneak peak" notice as well. Very few other people I know actually use Google calendars & I don't schedule meetings often. So this is an unnecessary intrusion into an otherwise perfect calendar system. If I wanted Outlook, I'd use Outlook. Keep that in mind, please. One other thought... why wasn't this just added as a Labs item? That would make it oh so much easier for those that want it to enable it and those that don't to get rid of it. Please enable Tasks to be shared with Calendars. This would be a REALLY useful feature, evidenced by the many forum posts to this effect! I'm having the same problem Courtney is having. How do I turn it off? If you open your Google Calendar in Mozilla Firefox you can turn that feature off. If you don't have Firefox you may have to install it but it definitely fixed it on mine! And now it's gone! How am I supposed to change meeting times if I can't see what times are available without closing the meeting and going back to the calendar? How do I turn it back on??? I too would like to turn this feature back on in Chrome or Firefox. Please post how to. Thanks. I have inadverteanly switched it off and now cannot turn it back on. Any tips on how to switch the sneak preview back on? aaaahhhhh it's gone for me too. I'm already missing it! same here, I want it back!!! Please tell us on how to tell "Sneak Preview" back on; It's really really useful! I know you gave us ample warning that it was going to go away. But now that it's gone, I realize how much I use it (as a Google Apps user). Please let us continue to use the sneak preview and do your improvements in the background! I want the preview back! this stinks not having it!!! Sneak preview was indeed very useful. Hope you bring it back soon! Any idea of when it will be back up? We anxiously await the return of the improved room and resource service, with whatever tweaks you're doing to it. It's so much more user-friendly for our users. OK - I get it... 'the sneak preview has ended.'... could you PLEASE get this message off of my screen please? There seems to be no way to tell it not to show this message again. Any time I edit an event, I see the message. Google Toolbar's Features in Google Chrome?